The father of a working class family is having trouble finding a job, because the local textile mill is hiring only inexpensive child labor. Reluctantly, he allows his oldest daughter to work in the mill. Meanwhile, in New York, the wealthy businessman Hanscomb is being urged to speak out against child labor, but he declines to do so. Then, while Mrs. Hanscomb and her daughter are traveling, the young girl accidentally wanders away, gets lost, and is taken in by the working class family. To help them, she takes a job in the mill. While this is taking place, Hanscomb has initiated a search for the daughter even as he goes about building up his financial empire. This silent film shows nearly thirty minutes of the famed Long Count Fight (also known as the Battle Of The Long Count) boxing match. This was actually a rematch between world Heavyweight champion Gene Tunney and former champion Jack Dempsey, held on September 25, 1927, at Soldier Field in Chicago. “Long Count” is applied to the fight because when Tunney was down the count was delayed due to Dempsey’s failure to go to and remain in a neutral corner. Whether this “long count” actually affected the outcome remains a subject of debate. Just 364 days before, on September 26, 1926, Tunney had beaten Dempsey by a ten round unanimous decision to lift the world Heavyweight title, at Sesquicentennial Stadium in Philadelphia. The first fight between Tunney and Dempsey had been moved out of Chicago because Dempsey had learned that Al Capone was a big fan of his, and he did not want Capone to be involved in the fight. Capone reportedly bet $50,000 on Dempsey for the rematch, which fueled false rumors of a fix. Dempsey was favored by odds makers in both fights, largely because of public betting which heavily tilted towards Dempsey. The rematch was held at Chicago’s Soldier Field, and would draw a gate of $2,658,660 (approximately $22 million in today’s dollars). It was the first $2 million gate in entertainment history. 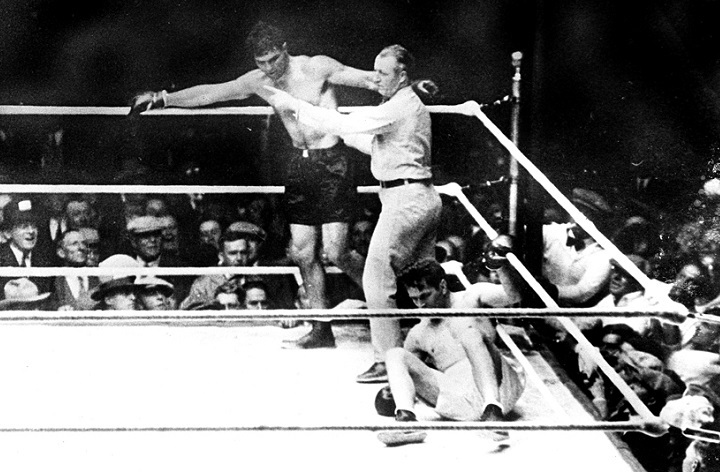 Despite the fact that Tunney had won the first fight by a wide margin on the scorecards, the prospect of a second bout created tremendous public interest. Dempsey was one of the so-called “big five” sports legends of the 1920s, and it was widely rumored that he had refused to participate in the military during World War I. He actually had attempted to enlist in the Army, but had been turned down; a jury later exonerated Dempsey of draft evasion. Tunney, who enjoyed literature and the arts, was a former member of the United States Marine Corps. His nickname was The Fighting Marine. The fight took place under new rules regarding knockdowns: the fallen fighter would have 10 seconds to rise to his feet under his own power, after his opponent moved to a neutral corner (i.e., one with no trainers). The new rule, which was not yet universal, was asked to be put into use during the fight by the Dempsey camp, who had requested it during negotiations. Dempsey, in the final days of training prior to the rematch, apparently ignored the setting of these new rules. Also, the fight was staged inside a 20-foot ring, which favored the boxer with superior footwork, in this case Tunney. Dempsey liked to crowd his opponents, and normally fought in a 16-foot ring that offered less space to maneuver. A woman tells her two competing suitors she will marry the one who brings her her favourite flowers. 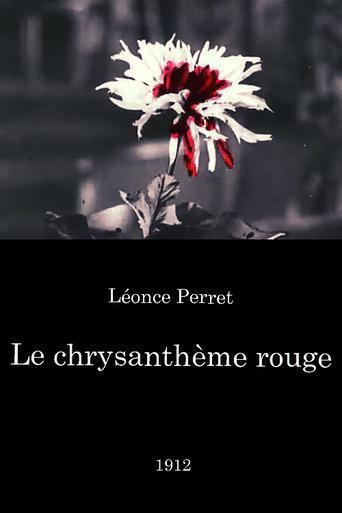 When she reveals that these are red chrysanthemums, one of the competitors resorts to desperate measures. “The Battle in the Clouds” (a.k.a. “Airship Destroyer”) is a really amazing film to watch. After all, even though its special effects are incredibly crude by today’s standards, it was exciting stuff back in 1909 and must have really wowed audiences. In addition, much of what you see was sci-fi for the time but would be used just a few years later in WWI! Historically speaking, this is an incredible film. During the course of the film you have no idea what the nationalities are of either side and I assume this is to increase the distribution of the film. No use offending anyone. Ironically, the version of this French film I saw bore a German title! It begins with some folks launching a blimp. It’s not a Zeppelin sort of thing but looks more like a pointed sausage suspending a platform. There is no way this small balloon would provide enough lift for the guys but that’s part of the charm. In fact, you see lots of blimps bouncing about–all little sausage-like things. But the main one is bad, as the crew start raining down bombs on the poor people below. Here is where it gets really creepy. Some inventors down below bring out their hardware to try to knock down the blimp–including a crude tank-like armored car, an airplane and a propeller-driven guided missile!! It’s really amazing stuff and rather exciting for the day. If you see this film and don’t know that this sort of stuff predates the use of such equipment in war and you don’t know how crude special effects were back in the day, then you probably won’t be that impressed. However, as a retired history teacher and film nut, I was simply blown away by this movie. This is a visualization of the life of patriot Nathan Hale which is based on a play by Clyde Fitch. Robert Warwick plays Nathan (and does a fine job) and Gail Kane the girl whom he loves (Alice Adams).